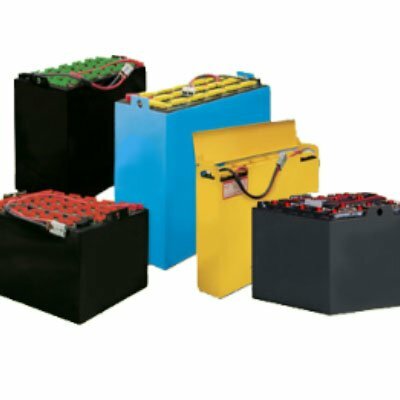 Crudele Equipment offers a wide range of replacement batteries both new and used as well as Battering Charging Options. Please contact one of our specialist to receive your quote. Ask us about our COMPLIMTARY Energy Meter Analysis. 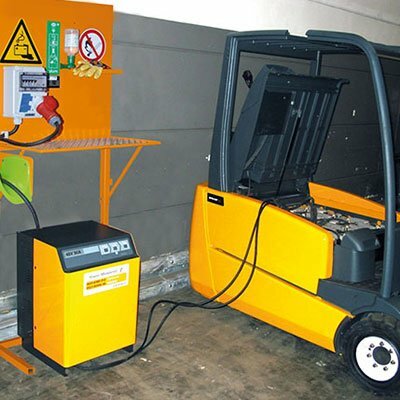 Opportunity charging is a system that allows forklift batteries to be charged during breaks, lunch, between shifts or whenever there is an “opportunity”. An opportunity charger works in the same manner a fast charger does, as it charges the battery to 80-percent state of charge during each charge, and then up to 100 percent after a recommended cool down period. The opportunity charger is best suited for operations that have multiple shifts and limited time for battery charging throughout the day. 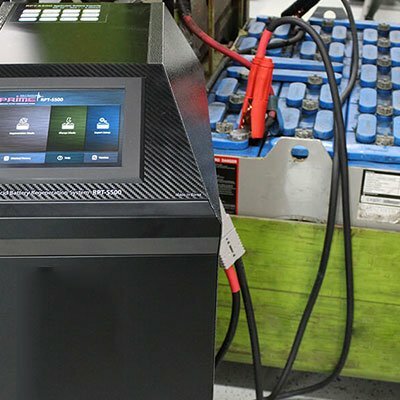 Forklift batteries take as little as 50 percent less time to charge than it takes to charge a battery conventionally in fast-charge technology. A fast charge will charge a battery in two to four hours. Fast chargers work quickly because they don’t turn down the rate of current the way a conventional charger does. These chargers keep the charge rate high during the whole charge time. Operations that have back-to-back shifts and want their operators to use the same equipment are good candidates for fast chargers. When downtime means lost productivity, fast chargers help keep things moving along. Your battery is not much good without a charger. While 120V chargers are available, you really need a 240V charger and the high current levels it can provide to adequately provide a balanced charge to your battery. A charger must be properly sized to not only the voltage of your battery, but also the amp-hour rating. A charger that is too small will not fully charge your battery, and a charger that is too big could overhear and damage your battery. Performance from a heavily used forklift battery will vary greatly, depending on your application. Overall, considering the reasonable price of a new forklift battery and the years of service you can expect and the fact that you don’t want to be having to replace a 3,000 lb battery bank every couple of years – a new battery set is hard to beat. 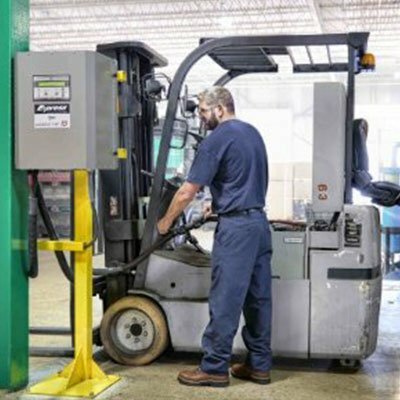 Crudele Equipment Services provides many services for Lift Trucks to include Repair Services all makes and models of Fork Lifts, Scissor Lifts, and Carts. Emergency Assistance, Replacement Rentals as well as Planned Maintenance Programs for your fleet. We also provide parts sales for most makes and models of lift and scissor lift trucks and carts.